Yes, we absolutely ate quiche growing up in NJ in the 1970s and early 1980s. My sister and brother sort of hated it, but I didn’t. I don’t remember when my mother started making it, likely around the same time Pierre Franey and Craig Claiborne began to revolutize what was put on tables all across America, but it was in regular if not frequent rotation on our dinner table, and now I know why: it’s one of the fastest, easiest things you can make on any night, you can add whatever extras inspire you, and it pairs beautifully with whatever you have to serve on the side. Another anecdote in my quiche-related food history: I also worked at a restaurant for ladies-who-lunched which featured a quiche of the day which was extremely popular, and the whole scene was extraordinarily uptight and downright dismal. Then that era ended, and I quite happily never ate another quiche until about five years ago, when I was served the best quich of my life at a child’s birthday party. Of course, the husband was French, and he had made the quiche in the classic mode, with cream and without any extra filling. It was perfectly rich, creamy, luxurious, and downright delicious. But I didn’t think about it after that for many years, until sometime after Finn turned 3, and was addicted to cheese, and I had nothing in my pantry to eat and those magic staples: milk, eggs, cheese, pie crust, came together and traveled some long forgotten synapse and Voila! I had dinner: quiche. I called it cheese pie, of course, to trick my son, and made it as my mother had, with a pile of swiss cheese grated into the pie plate and a scattering of pancetta (ok, my mom used ham). Neither Ella nor Finn like anything but the crust, but I was determined to make this work. Since it tasted nothing like the one I remembered from the party, some time later, I pulled down my copy of Julia Child’s Kitchen Wisdom, which is kind of like crib notes for Julia, found the classic recipe for quiche, and tried again. The quiche was a huge hit, I tell you. Huge. Now, it’s become one of Ella & Finn’s favorite things to eat. The cheer–quite literally–when I tell them it’s on the dinner menu. I have to hide if I cook it early, which is why I have only a photo of the ingredients to show you. And I have to restrict their servings, or else they’d eat the whole damn thing. Best of all, it takes about 5 minutes to whip up, and for a family of 4, it’s good for 2 meals, and it keeps extremely well at room temperature, which means it’s the perfect thing to make on the nights that I teach and have to leave the house by late afternoon. The recipe is a general guide for proportions. You can add whatever cheese(s), diced or chopped vegetables, or meat that you like. Be inspired. Bon appetit & happy time travel. 1 large egg for every 1/2 cup milk or cream. It really is much better with all or part cream, but it’s just fine with whatever milk you have on hand. 1 Pie crust. Of course it’s best to make your own, but I always keep TJ frozen crusts in my freezer because these days I don’t always have time. Though I could have whipped up a pie crust or 2 or 4 in the time it took to write this. But that is another story altogether. 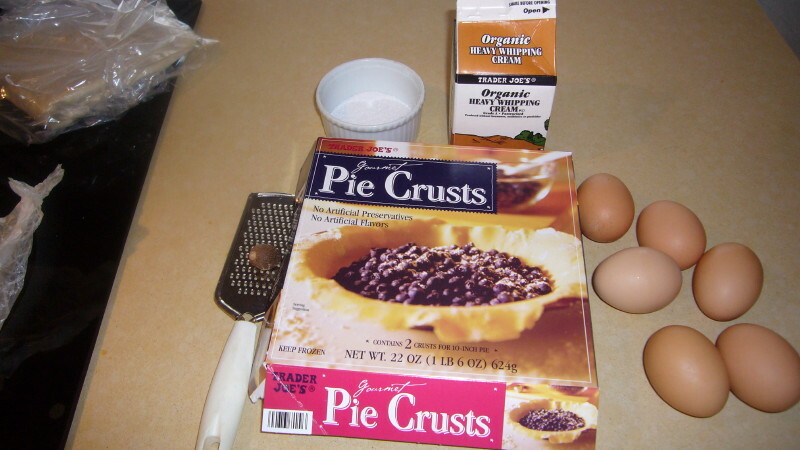 If you’re going to add grated cheese or any vegetables, sprinkle these into the pie crust before adding the cream and egg mixture. Bake at 350 degrees for 30-40 minutes, until puffed and golden brown. You can even use your convection oven.